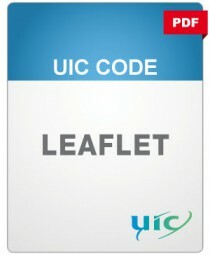 This leaflet contains technical regulations for ground-train radio systems in international traffic. It defines the scope of the leaflet, describes operating modes plus minimal technical specifications. Detailed provisions ensuring quality of communications are also given, with emphasis on: location of fixed installations, radio coverage, technical transmission/reception characteristics, fixed and mobile aerials, operating modes, quadri-frequency sets, auto-switching of mobile-set frequencies, cable links, loudspeakers and tractive-unit micro-telephone sets. The leaflet then defines the frequency chart: setting-up and allocation of channels, joint frequency bands, distance between channels, duplex channels, numbering of channels, intermodulation, preferential channels, switchable channels and simplex channels aboard tractive units. The different radio-control processes are also described: idle mode, connections, operating provisions and warning procedures. The corresponding command signals are explained in detail. Links between motive power unit and RIC coaches together with the corresponding communications between drivers, central control and train staff are explained in specific terms. Finally, the leaflet describes the special features of the ground-to-train radio system with selective call and message transmission by digital code, as well as those of the radio-telephony system with simultaneous transmission of digital messages.